When all the fights are over and couples are made, they can start making an nest. Emperor penguins have finished yet, because they make no nest. They lay one single egg and take it on their feet, holding it against a bare "brood patch", keeping it warm under a feathery fold of skin. 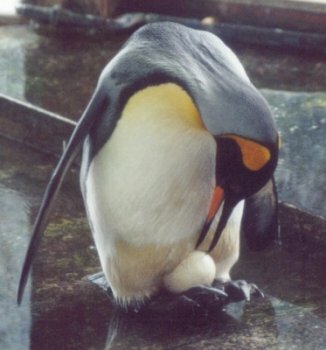 King penguins also breed that way. They defend their place, with a diameter of about 50 à 70 cm (range of their bill and flippers) against their neighbours, although there is no real nest. They only defend their own hatch against enemies, and don't form one front against them. In opposite to emperor penguins, which depend from each other for warmth. They stand very close together in a circle, constantly turning around, so each bird has the chance to warm up in the centre. 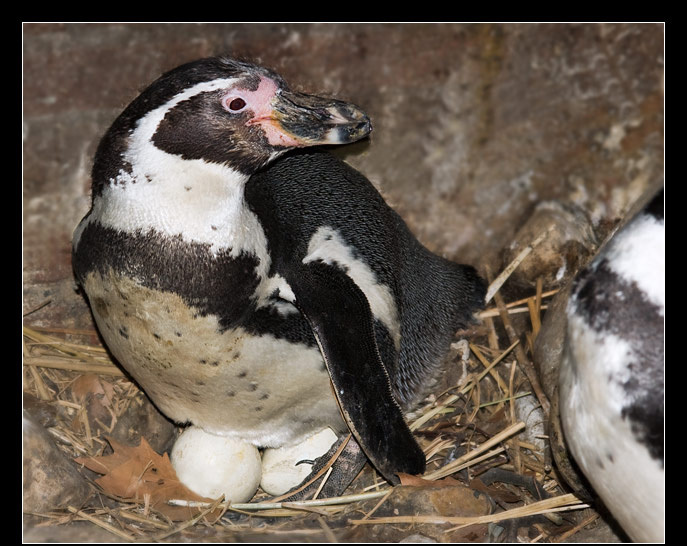 Emperors breed namely during the Antarctic winter, with temperatures of about -40° C.
All other penguin species build some kind of a nest. 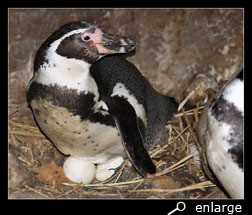 The Spheniscus penguins (Humboldt, African, Galapagos and magellanic penguins) and the little penguins nest in holes and burrows to protect theirselves against the sun. They dig a burrow with their bill and claws of their feet to a depth of about 1 m in the ground or guano. Then they decorate it with all the soft materials they can find, like twigs, leaves and even paper. In some nests you can find cans, oil barrels or film material. These sadly proves again how unconcerned we are about our environment, leaving rubbish everywhere. All other species build a nest like it is usual among birds. 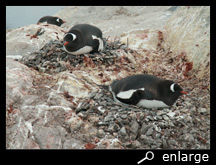 The Pygoscelis (adélie, gentoo and chinstrap penguins) make nests with stones, as this is almost the only material they can find in their neighbourhood. As they live close together in large colonies and stones are rare, they steal a lot from the others. Following anecdote will prove how important such stones are: "Some adélie females pretend being still single, allowing males to court for them. He tries to impress the female ( as is usual among adélies) by offering her little stones. The bigger and more beautiful a stone is, the larger the chance to become a couple. Females take advantage of this, to improve their already existing nest. By the time a male finds out, she is making a fool of him, it is usually too late." Advantage of a nest of stones is : they lay higher as the surroundings, protecting the chicks against hypothermia through meltwater and rain, which regulary washes the surroundings and excrements away. 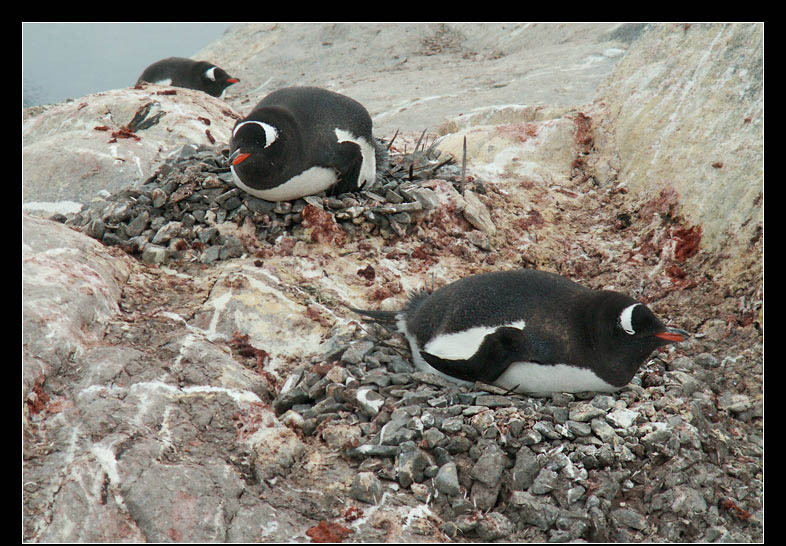 Crested penguins (Eudyptes) build their nest in existing holes in rocks. They too, decorate it with soft materials and all they can find. Depending of the species, they nest close or not close together. 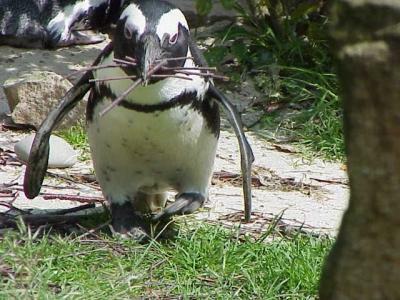 Macaronipenguins stay close together in large colonies, whilst fiordland penguins build their nest far from each other.